Homeowners associations (HOA) are legal corporations formed by a real estate developer to market, to manage, and to sell homes and lots in a residential subdivision. They’re most commonly formed for condominiums and planned urban developments (PUDs), a category which includes suburban communities. HOA Articles of Incorporation typically grant developers privileged voting rights in governing the association during its infancy, while providing the means for the developer to exit financial and legal responsibility for the organization, transferring ownership to the homeowners of the association. This transfer typically occurs after a predetermined number of units have been sold — often two-thirds of the available lots and/or units. Each homeowners association enforces its own governing documents in the form of restrictive covenants, by-laws, architectural guidelines and regulations. Together, the “rules” of an HOA are meant to define the community standards for the purpose of protecting property values. Restrictive covenants vary widely from homeowners association to homeowners association. Covenants may include guidelines on issues as varied as where parking is permissible; planned architectural improvements; and, landscaping. 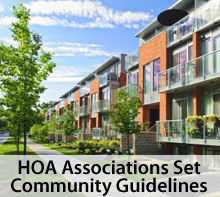 Homeowners associations make their by-laws available upon request to existing, governed homeowners and will often make by-laws available to prospective home buyers as well. Review community guidelines before buying into a building or neighborhood, and before beginning a home improvement project. It’s important to know what actions are permissible and what actions are not. In addition, most mortgage lenders require HOA by-laws as part of the mortgage approval process.